“Behold – Galvontron”. Wait, that’s not how it goes. 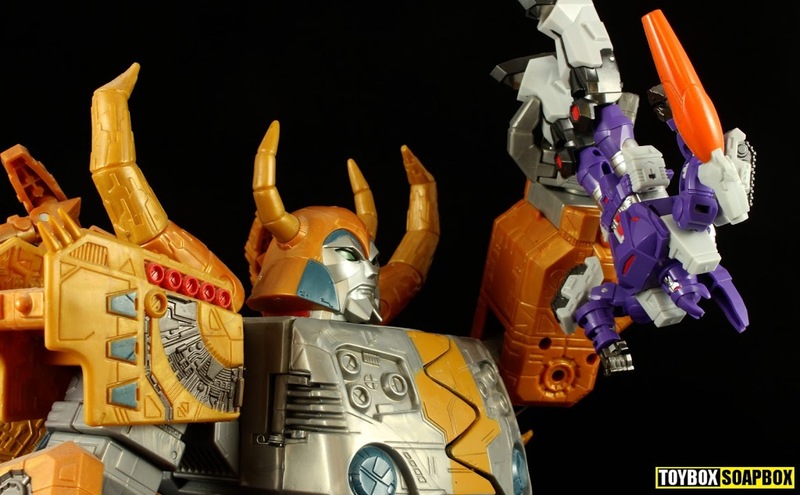 Third parties are leaning ever closer to Hasbro’s trademarked names without ever jabbing their flag right in the face, and Galvontron is comically close to the character it’s intended to be – Galvatron. Mechfanstoys like to prove they don’t discriminate when it comes to knocking off toys, this time pinching a fellow third parties figure in the form of DX9’s Tyrant. But making it better. Does better mean different enough to not feel shady? Read on to find out. 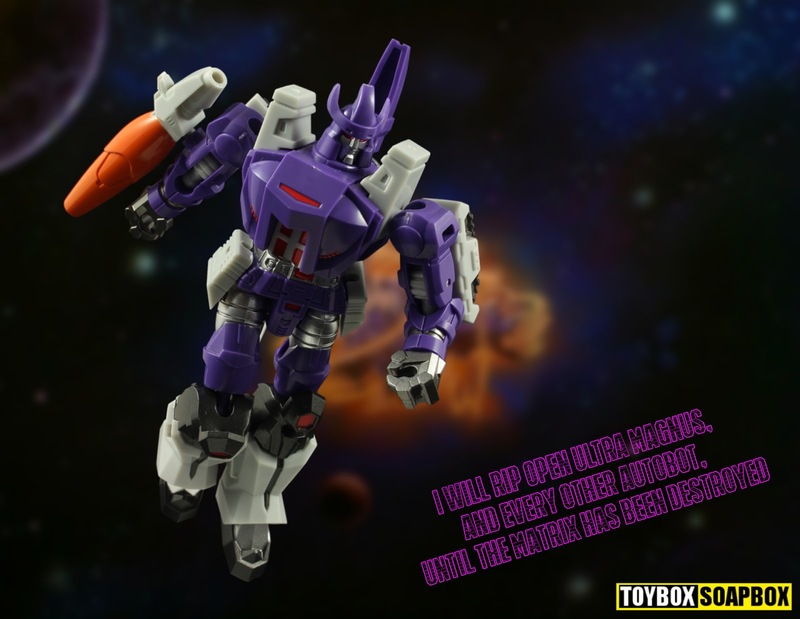 As a character spinning out of the 1986’s Transformers the Movie, Galvatron came with a brand new entirely made up alt mode that laughed in the face of the series tagline – “Robots in Disguise”. As a sort of undead Megatron, he moved from a realistic pistol to a rebirth as a large literal Decepticon purple space laser cannon. Easily more badass, it’s debut appearance causing Starscream to brutally crumble to dust and turn into a ghost nsured it nabbed in a place amongst the iconography of the Transformers universe. It’s a cannon that causes people to turn in phantoms, because Starscream is the only guy who dies at it’s hands so the evidence says it’s effectively a spirit cannon. Turning into a purple and grey barrel with an orange vase tacked on has never posed much of a problem for toy makers and even at small legends class scale DX9 didn’t struggle too much. Mechfanstoys have taken DX9’s already pretty fun toy and upscaled as they did with Combiner Wars Powerglide. As a consequence, some of the compromises of the original toy become more apparent but it’s hard to be critical of it when you think about how small it was originally intended to be. It’s a legends class design that’s been doused with Miracle-Gro. Far from being just a straight KO, Mechtoyfans have decided to tinker and added a couple of improvements beyond inflation. First, Galvy gains new hip pouches that bulk out the back and hide some of the legs, but their chief purpose is for robot mode so lets hang fire on those for now. Second, and far more importantly, the manufacturers have sculpted brand new tank treads to replace the featureless bricks of the original. Better, stronger, faster, more tankyer. Space cannon mode isn’t perfect and it does look alot like Galvatron doing push ups on his elbows and curling his legs whilst wearing a giant vase as a hat….wait…surely that makes it perfect? Transforming Galvontron (he sounds like a German Count, right?) is easy peasy and mainly just involves unfurling him like a crumpled up piece of paper that someones lobbed across the classroom. Unfurling it doesn’t mention a kick about on the field at break time, but it does feel pretty satisfying as you conjure a very curvacious horn headed geezer. The torso flipping over and compressing is a highlight that feels a bit above what you’d expect from a legends scale figure but at home on a figure more this size. Titans Return does that sort of thing all the time so it ensures the figure feels very intune with what people are currently buying. It’s fun and I think I’ve now done it about 15 times on autopilot whilst drinking many a glass of Um Bongo and watching Wrestlemania weekend blur by. Robot mode is devilishly handsome. There’s no modern vehicle parts or homages to deal with – it’s dead on Galvatron. The only real differences are that instead of looking like a purple Michelin Man his curved edges follow a sharper more aggressively wood cut style. It’s how I’d imagine Leinil Yu would draw Galavtron with harsh, vicious edges. Just look at those booties -it’s all hard angles to emphasise stamping on peoples faces. Proportions are excellent too and the shoulders sit slightly closer to the torso the original DX9 incarnation which makes the body shape look a lot neater. Galvontrons purple and grey reminds me of a Gola shell suit my grandma bought me in the 80’s on a Mablethorpe holiday, that I wore for 10 minutes before covering in paint due to a football related incident that involved a Texas Tornado WWF tshirt, some trespassing and ghosts. Galvy is nothing if not garishly stylish, whilst I just got chased round a chalet site by angry Grandparents. Galvontron, unsurprisingly, has a face. Mechfanstoys changed the treads on this toy and I wish they’d seen fit to alter the face too. It’s not awful in a scarred Darkman way, but he looks way too happy – and not in the appropriate evil kind of way. The expression is one of joy at watching adorable cat videos on Youtube. He’s supposed to be mean, sneery or laughing in that mocking way I do at work when people ask me if I can help them with something. Each detail is pulled right from the standard Galvatron design we know and love and there’s been no skimping on paint to make those details pop. Mechfanstoys are working on a principle I really like, by putting the right amount of paint on all the right details. With the exception of his shoulder pylon things but I can let that slide because amazingly this doesn’t feel like the cheapo knock off that it is. “You are being deceived”….but in a positive way. Scale wise he is too small to fit in with any official iteration of Cyclonus or Scourge unless you are looking for them to star in a reboot of “My Two Dads” (god bless you Paul “Adios Muchachos” Reiser). Galvontron comes in at smaller than a deluxe but larger than a legends class figure, so he occupys a weird space of not fitting in anywhere. He’s as tall as classics Bumblebee if you are looking for a reference, so not a small toy by itself but not big enough to scale well in a classics collection. Galvy aint no minibot. There’s potential to upscale this further because as a taller deluxe he’d own the position of Classics Galvatron. A common achilles heel for Galvatron toys is the cannon only mounting one way on the arm and it’s something Mechfans didn’t rectify. The cannon can only pose on the side of the arm, despite how certain blu tak aided pictures in this article may appear. Adding a bicep swivel would have been the way to go and the only (non modding) way he can wield the cannon on top of the arm is by holding it in his tiny fist holes. These are not standard 5mm compatible but why would he need to hold a gun when he basically is one? Galvontron packs a little bit of bling with a miniature Matrix that comes with it’s own chain so it can dangle from his neck, just like in the movie. I prefer to imagine it’s actually from his 80’s hip hop phase after he took to heart someone calling him a public enemy. Flavor Glave? So that is that. Galvontron is a cheap little curio that’s not intended to claim any exalted position in your collection. The quality is far superior to their earlier Powerglide KO which itself was pretty great and there are many far worse ways to spend £12, or whatever this cost. Added value springs from you not treating it as a collectible but as a cheap toy to just mess with from time to time with no fretting or fear over paint chips or any of that gubbins we all sweat over. Of course, it’s a KO, even though it’s been improved, so you may not be into the idea of it but we’re already in dubious moral territory when it comes to third party products and this is just another wave on those seas. On it’s own merits is a fun Galvatron figure that looks bang on like Galvatron and will have you humming that electronic organ music from inside Unicron. Alot.